”Grandmamma, what happened to your foot? How come you are missing part of your heel?” they asked. “The answer to those questions, my loves, is a story,” said the grandmother. 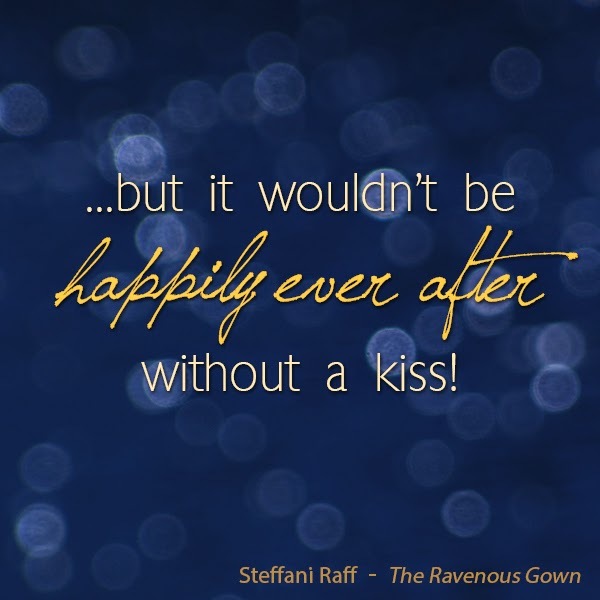 This article is an excerpt from Steffani Raff’s The Ravenous Gown. “Tell us the story,” three eager grandchildren chimed. The boy with freckles sat at the foot of the rocking chair and placed his head on her lap. The girl with inquisitive eyes watched her grandmother from the floor. And the girl with a propensity for romantic ideas sat on the fireplace hearth to keep warm and have a view of her siblings’ reactions to their grandmother’s story. “Prince Henry?” said Inquisitive Eyes. “He’s only eleven!” said Romantic Ideas, stunned. “Oh,” they all said in unison. “A long time ago, when my hair was the color of raven feathers and my cheeks flushed the color of roses, I held in my hands a most unusual opportunity. Prince Gerald had signed and sealed an invitation to every eligible young lady in the kingdom to attend a ball. He was going to break a tradition that had been standing among royalty since time began. He would choose a bride from within the kingdom. A commoner! It was unheard of! A commoner marry a prince?! I was dancing with the Prince, wearing a gown the same green as my eyes. I was captivating. The swish of my dress, the gentle ring of our laughter, the joy in our eyes—it was true love. I would be a princess. And what a different life that would be: no long hours toiling over someone else’s clothing, no worrying about how or where I would get enough to eat. I would have servants and privileges. I would have prominence and prosperity. And I would have a handsome husband. “But it was only a dream. I didn’t have a dress for the ball. And even though I had the talent to make a dress, I knew with an announcement like this, I would be working every lighted hour at the dress shop for Mrs. Fister. Every girl in the kingdom would order a new dress. I would be so busy sewing their dresses, I wouldn’t have time to sew a gown of my own. “Each night, I worked on dresses by candlelight. I worked until my fingers ached, until the fabric blurred in front of me. I hoped by working thus I would have enough time to sew something for myself. But the orders just kept coming in. “The night before the ball, a devious plan took shape in my mind. One client could not decide on whether she wanted a red dress or a green dress, so she had the audacity to order both! The red dress was finished, and it was a wonder. The color was divine, and you should have seen the way the sash clung to her waist, then burst into a bow in the back. The dress was perfect. “Unless what, Grandmamma?” asked Romantic Ideas. A sweet, naughty smile slipped onto the grandmother’s face. “Unless I altered it so it would fit me instead. She had two choices, after all. She would look dashing in the red gown, and I could wear the green gown. “I did!” the grandmother laughed. “After everyone left the shop, I stayed under the pretense of finishing the dress. I held the green gown, soft and silky, in my hands for a very long time, and finally, all at once, I tried it on. I started pinning the needed alterations and customizations. I sewed and sewed, then tried the dress on again. It fit perfectly. I twirled in front of the mirror; I had transformed into the beautiful girl in my dreams. I was going to the ball. I would win the hand and heart of the Prince. “But suddenly, I heard a crash at the front of the store. If anyone saw me, I would lose my employment and perhaps, much more. “I dove behind some bolts of fabric, heart pounding, tears welling, body shaking. I held my breath and willed myself to listen. The children were up on their knees, faces anxious in the warm, golden light of the room. “What happened?” Freckles asked, unable to bear the suspense any longer. “It was a cat!” The grandmother laughed. “Yes, a cat! When I went home that night, I purposefully left an unfinished sleeve and hem on the dress. The next day the client was furious when I told her the green dress was not done. “‘I worked all through the night but couldn’t finish. I’m sorry,’ I said. “‘Where is the head seamstress here? She will hear of my displeasure!’ she continued ranting. “That’s when Mrs. Fister came in and got an earful about dresses and the cost of dresses and unfulfilled orders and unfulfilled expectations. “But you didn’t lose your job?” asked Inquisitive Eyes. “No, I didn’t,” said the grandmother, then continued. “When the dresses were all collected, Mrs. Fister closed up the shop early. She had two daughters of her own to get ready for the ball. I stayed with the promise that I would finish the green dress and it would be ready for the client in the morning. “I went right to work on the sleeve and the hem, and in no time, I had the dress on and my hair pinned up in a most elegant style. I pinched my cheeks, then looked in the mirror. It was the most beautiful I had ever looked. I was even more beautiful than I thought I could look. I would win the Prince’s admiration—I was sure of it. “Grandmamma, I can’t believe you did that!” said Freckles. “Yes, it’s perfectly horrible!” said Inquisitive Eyes. “Fine, fine. On with the story. The ball. The ball was colorful. So many women, so many dresses, so many glowing eyes, so much anticipation. The smell of a thousand flowers in the air. “There was a banquet of food, but no one dared eat. We all waited for the Prince. “He’s old and fat now,” said Freckles, giggling. “On Cinderella?” asked Inquisitive Eyes. “What?” they all said in surprise. “He strode the distance between us and asked me to dance. The music swelled and filled the hall as we danced. Just like I dreamed, except the Prince didn’t say a word. He just held me in his strong arms and led me across the floor. When the music changed, he kissed my hand, thanked me, and in a few steps, he was gone, dancing with another beautiful woman dressed in a lilac-colored gown. I watched in wonder as the Prince switched women dance after dance and sometimes in between. “‘Yes,’ I whispered. I turned around and took the hand of a royal guard. His uniform made him stiff on the dance floor, but he had me laughing in minutes. He mixed flattery with kind-hearted jabs at the banquet. I added a few jabs myself that brought such a smile to his face. I almost missed his smile, though, because I was so busy looking for the Prince. The dance floor was littered with so many couples now, it was difficult to see him. “The Royal Guard and I visited the banquet tables, pretended to eat, and continued to laugh. “I had to leave the ball early to make the alterations on the dress I was wearing, so it would be ready for the client the next morning. I dared not displease this particular customer again. “I hoped to see a glimpse of the Prince before I left, but it was not to be. “I danced around and around the dress shop in my underslip, recreating my moment with the Prince. I was filled with hope. After all, he chose to dance with me first. “For several days, nothing happened. Then, I received a letter from the King. The Prince had fallen in love with a woman in the kingdom, but he did not know her name or how he could find her. My face flushed at the news—it could be me. A royal entourage would be visiting each house in the kingdom to try a glass slipper on the foot of every eligible maiden. If the shoe fit, she would be chosen as the Prince’s bride. What would life be like? A real princess. No more sewing dresses, at least, not unless I felt like it. Nothing to worry my head over—just pure bliss. “A great commotion began. ‘We’ve found her! The shoe fits!’ The Prince burst through the door with an elated smile, which deflated when he saw me. ‘The shoe fits?’ he said, confused. “I swallowed, then beamed at him, ‘Yes!’ I minced the distance between us hoping he was true to his word, but he wasn’t looking at me; he was looking at the floor. ‘What is that?’ he asked. I had left a trail of blood behind me. ‘Show me your foot,’ he commanded. I lifted my skirts to reveal a slipper sloshing with blood. I turned away, too afraid of what would happen next. The Prince touched my arm with such tenderness; I looked at his face. ‘You were not the first to use such measures, nor will you be the last, but I cannot marry you,’ he said. “The royal party left in swift procession, carrying with them the shoe and my dreams of a better life. I was left sobbing on the floor with a bloody foot and no hope of repairing it. “The Prince?” gasped Romantic Ideas. “No. The Royal Guard I had danced with. When he saw me, he swooped over to my aid. ‘What happened?’ he said, not trying to hide the alarm in his voice. “‘Just before sunset,’ I replied. “Grandpapa was the Royal Guard?” Freckles asked in wonder. “Yes,” the grandmother smiled. “Did you ever tell him the truth?” asked Romantic Ideas. “Then I told him how happy I was to be married to him instead,” said the grandmother. “That’s when I swept your grandmamma up in my arms and said, ‘You never had to be.’ Then we kissed like this,” said the grandfather, kissing his wife. “Are you done yet?” Freckle’s voice interjected itself into this happily ever after. “Done with what?” the grandparents asked in mock innocence. “Kissing!” said Inquisitive Eyes, horrified. “Grandparents don’t kiss,” Romantic Ideas chimed in. “Especially not in front of grandchildren,” said Freckles. “But it wouldn’t be happily ever after without a kiss!” Grandmother laughed and kissed her husband again. Click here to read your kids a tale of inner beauty: "What If a Magic Mirror Could Show You Who You Truly Are?" If you like Steffani’s articles, you’ll love Steffani's books!